Conference tourist point of view. Written by Konstantin Dranch. 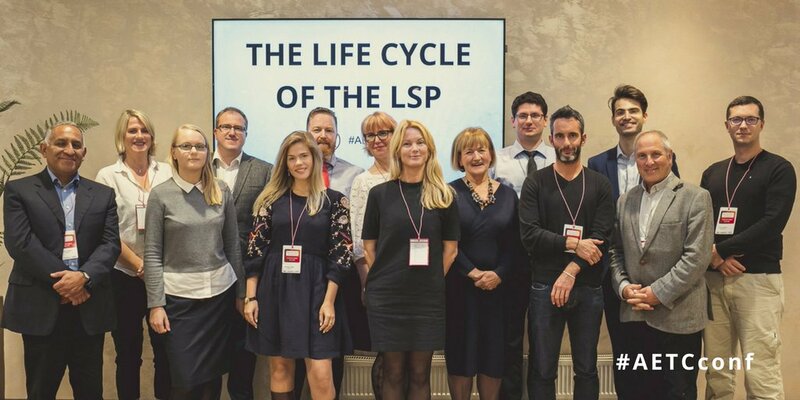 Life Cycle of an LSP, organised in Tallinn by EATC, turned out to be different to the plethora of other events in the translation industry. For a smaller-sized conference, it featured exceptionally strong content and excellent networking. It brought together around hundred attendees mostly representing local LSPs. This is impressive for Baltics with their tiny combined population of 6.1 million. 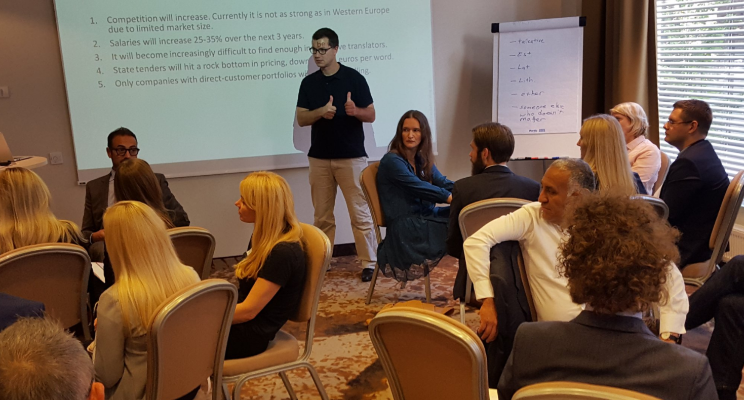 The first day of the conference featured market statistics and a forecast workshop. Both I and Didzis Klavins (Tilde) drew heavily on fiscal data exported from business registers. According to this data, the LSPs in Estonia, Latvia, and Lithuania attained over 77 million euros in total sales last year. This may seem small in absolute numbers, but relative to the tiny economy size the Baltic LSPs generated an absurdly high amount of cash. They did it by exporting and selling overseas. Baltic companies mostly sell to other LSPs and have become very adept at offering a standardised service. All mature players have 2-4 ISO certifications (9001, 17100, 27001), a gorgeous website, membership in GALA & Elia, a commercial TMS and a set of CAT-tools that meets 99% of potential requirements. Selling to direct clients is a different story, with two larger players Luisa and Linearis dominating local markets and being attacked all the time by smaller competitors with 2x lower rates. Tilti, Ad Verbum, Nordtext, and Synergium are the few examples of Baltic companies that to some extent have met with success winning Western corporations. Another research finding is that the Baltic LSPs face pressure from their countries' rapid economic growth: IMF forecasts Lithuania's GDP to grow by 33% in 3 years, leading to record-low unemployment, salary raises and a steady increase in business costs. At the same time, the local market demand growth will not offer a fitting compensation for this bump in internal expenses. Already more expensive to run than counterparts in neighbouring Russia and Ukraine, Baltic LSPs will have to optimise internally or increase rates to hold on to current net margins. Conference second day featured presentations by Arturo Quintero, a co-founder of Moravia. Appearing after two year's absence from the translation business scene on the stroke of time, as the announcement about Moravia's sale for $320 million shakes the industry, Arturo spoke about his journey building the company together with his ex-wife Katerina Janku, ending with divorce and sale of his stake in 2012. He focused on personal entrepreneurial challenges, leaving a few hidden clues for other businessmen to follow. Arturo attributed Moravia's early success to investing in tools once they became available and winning large IT clients via tech partners (they've been the only user of Trados in Central Europe at the time). At the time, Moravia had been perceived as a lower-cost vendor than its European competitors in Germany and Scandinavia, while in reality, it bargained hard for good conditions. This helped when clients such as Microsoft and Oracle squeezed their vendors for better rates. Focus on large clients, and being able to offer them more and more languages drove Moravia's growth. In the closing speech, Arturo spoke about exit strategies and his preparations for sale at Moravia. He explained that the management worked for two years to develop a data room and put in place contracts, financial data and other documentation for a prospective sale — all in secret from company's employees. The owners rejected early offers to sell, but when a serious one from Clarion fund came along, they were ready to demonstrate and defend the company's valuation. Andrew Hickson's (Ludeo, Netherlands) personal survival story about withstanding life's difficulties with an entrepreneurial spirit, and going through a bankruptcy in the Netherlands. Miklos Ban's (Proford, Hungary) report on running a national association in Hungary and making an impact on the market. No doubt Proford's moves may serve as an action blueprint for a bigger Baltic association (at the moment only separate Estonian and Lithuanian industry bodies exist). Isabella Moore's (Comtec, UK) practical templates with company KPIs and performance measurement. Katja Virtanen's account of running an LSP in Finland. The takeaway is that Finnish and Scandinavian markets offer significantly better opportunities than those in the Baltics. By focusing on the national market only, Katja was able to build a 3.7 million euro LSP - a larger company than any in the Baltics except Tilde. Of course, many Baltic players eye the Nordic markets, primarily for translations of clinical research. However, winning clients there is extremely challenging and requires significant investment in building sales teams. 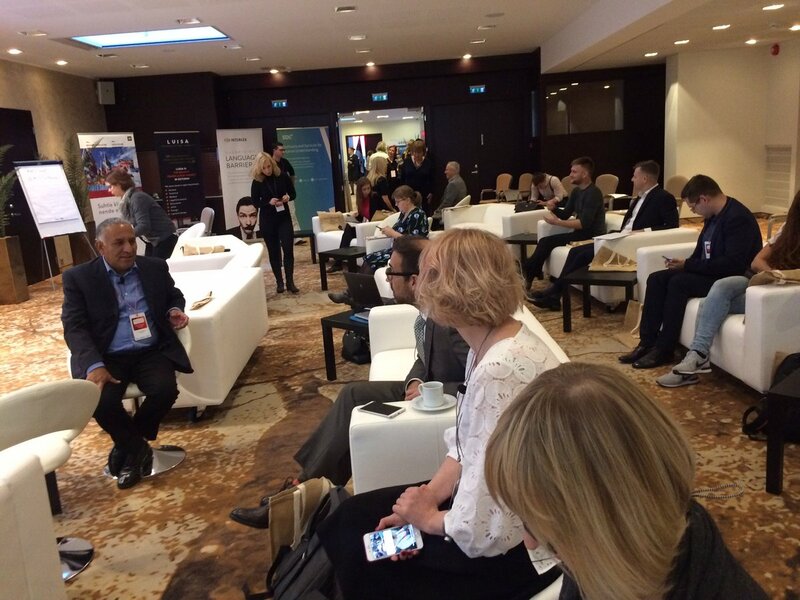 Aside from coffee breaks shared with bankers arriving for meetings dedicated to Estonian presidency of the EU, the conference featured discussion and networking sessions moderated by Stewart Johnson — an American translation editor during the day and standup comedian in the evening. Juxtaposing humour with serious questions, Stewart held the audience active and engaged even at the end of the conference day, a traditional time to lose focus and succumb to idle chit-chat. The main day dinner did not feature dancing or singing so familiar to GALA, ATC and Elia patrons (and so scary to suitably reserved Estonians). Instead, the conference organiser Inge Rätsep brought the crowd into a hip restaurant and treated everyone to a culinary delight with artisanal dishes and craft beverages. The restaurant's young staff presented each course listed its ingredients and explained the local flavour. For example, salads included berries and stewed mushrooms from Estonian countryside, while digestif drink selection featured local liquors. Quality food, lack of pressure to sell, and somewhat quieter atmosphere that at other events led to more discussion time and more opportunities to develop relationships. 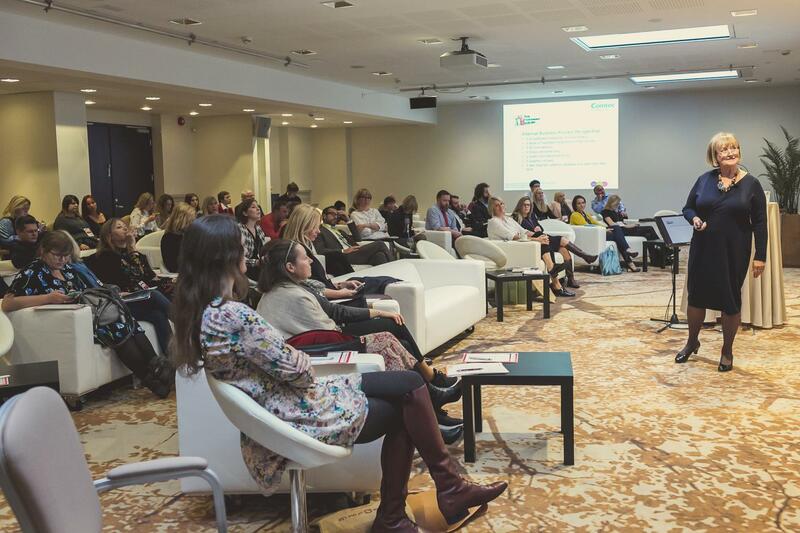 Many of those who came to Tallinn this time experienced their first industry conference. Therefore, the event is bound to play a unifying role for language services professionals in the region.